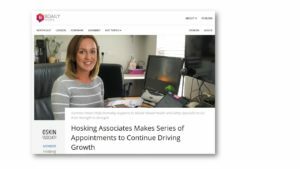 Hosking Associates, the health and safety specialist, is delighted to announce four new starters to its growing St Albans based team – as the company continues to go from strength to strength. Tim Birkin is joining Hosking Associates as a Safety and Health Practitioner. Katie Medd, a versatile brand and marketing professional, is lending her creative thinking and project management skills to reach out to organisations looking to make safety & health a brand differentiator for their business. “My 27 years in the industry have shown me that building strong, trusting relationships with our customers is the best way to make a positive impact on the health and wellbeing of businesses and their employees. This is not possible without the commitment and creativity of dedicated professionals – health and safety is about looking for solutions, not problems, and we do it with personality which would be impossible without a dynamic team!